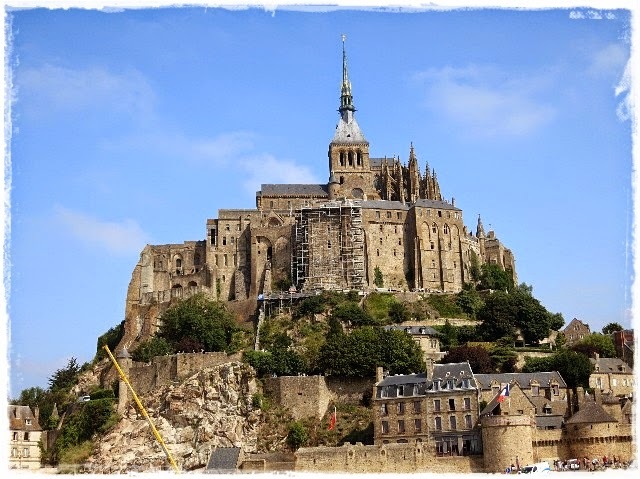 I've been wanting to see the Mont St. Michel for a long, long time, but since it's well over an 8 hour drive from our home it's not so easy to get to. I've lived in France almost fourteen years now and I decided this summer, by golly, we were going. Everyone says you shouldn't go in July or August, France's prime vacation season, but the package we got was surprisingly the least expensive in July (like a third of the price), so I thought, "What the heck, let's go anyway!". And you know what? All those people who said DON'T go in July or August, well...they were right. 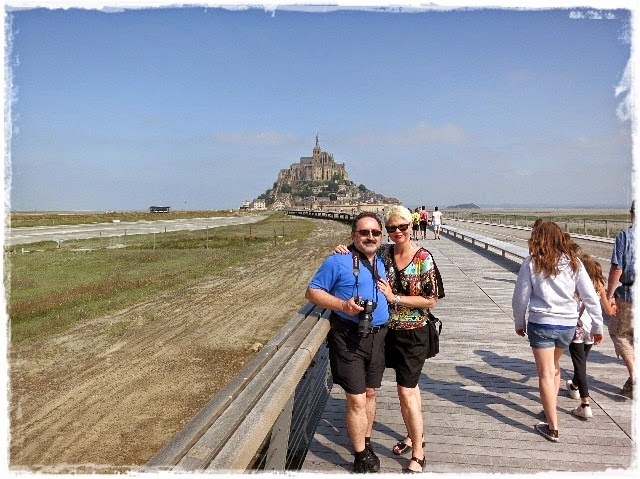 The Mont St. Michel is on an island in Normandy and is one of the most visited and photographed sites in France. It's been occupied since ancient times and the abbey at the top dates from the 8th century. The Mont used to be a true island at high tide, but through the centuries the area around it has silted up. The French government is investing heavily to return it to its true island state and has been busy constructing changes to its access. Everyone is obliged to leave their cars at a specific parking area 2.5 km away. You can then take a shuttle to arrive closer to the Mont (you'll still have about a two block walk after that) or you can use the new pedestrian bridge my husband and I chose (in the picture above) that just opened the day before we visited. Having seen the Mont so many times in photos, and dreaming of seeing it myself for so long, seeing its majestic presence in the distance as we approached was awesome. It was the same feeling I had when I saw the Tour Eiffel for the first time, or St. Mark's Square in Venice. I just kept saying to my husband, "Wow! Can you believe it? Wow!". He'd been there before so he wasn't quite as impressed as I was. And then, the closer we got, I saw...construction. A crane's arm I can probably photoshop away, but scaffolding? Phfff, I was a tad disappointed. Since they were still working on the area around it, everyone had to enter and exit by a single wooden walkway about the width of a sidewalk. It was not a pleasant wait and the line was long. When we finally got inside, this is what awaited us. 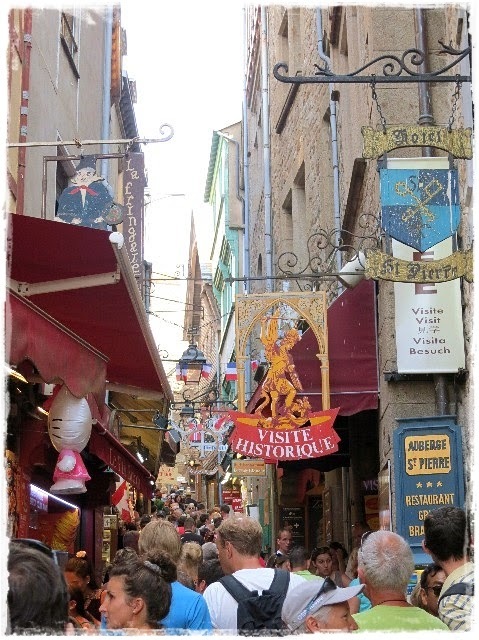 There are supposedly almost 3 million visitors a year to the Mont St. Michel and it sure seemed to me like a third of them were there on the same day we were. It was almost impossible to move freely in the tiny crowded streets. 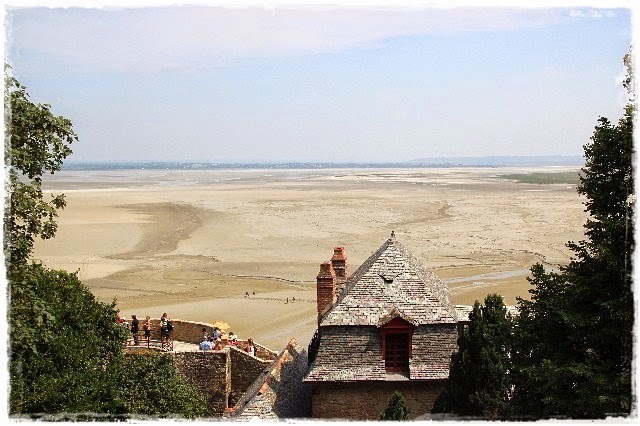 This is what the area around Mont St. Michel looks like at low tide. The little specks there are people walking on the sand. You have to be careful though, the sand can be dangerous if you don't know where you're going. The line to enter and tour the abbey at the top was hours long so we decided not to see it. Only about 25 people (including monks) actually live on the Mont. It was hard to appreciate the Mont's history and beauty with tacky tourist shops everywhere. It probably would have been much better in the Fall when it's not so crowded. Still, I can say I've seen it now and it was worth the visit. We did take the opportunity to dine at the famous Mere Poulard restaurant while there, which was a very enjoyable experience indeed, more on that later. Shani nous avons presque le même temps en France, je suis Vénézuélienne et j'habite ici depuis 15 ans! Je voyais le Mont St Michel dans un livre de géographie de ma grande sœur quand j'étais petite, et sa beauté m'avais ensorcelé! Je suis allée 2 fois: en été et en hiver, et crois-moi il est toujours magnifique même avec le ciel gris. C'est un endroit magique! J'espère que tu as passé un très bon séjour! As you know we will be there soon. Thank you for your pictures and personal notes about the area. Had a mild heart attack last week and two more stents installed, but despite all that I feel great and raring to go on vacation. Off for my morning walk. Thank You again. 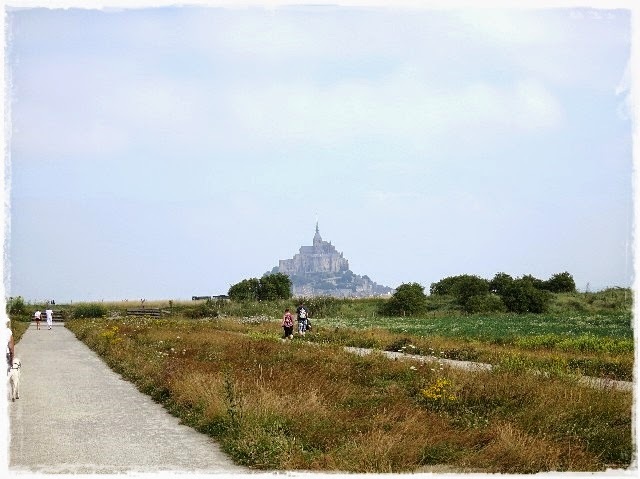 I would love to go see Mont St. Michel one day and glad you finally made it after so long. It is disappointing to go to a famous historic place only to see tourist trinkets lining the sidewalks but sounds like you were able to look past that and the crowds to see the beauty of the place. I will make it a point to go in the Fall or Spring if I get the chance to visit! I was there in the Summer of 2007, but I don't remember it being that crowded! Would love to visit it again.